Baby Proofing InfoGraphic: Do We Need To Go That Crazy? Baby proofing your house has become a serious industry. When we were children, we sat in the car without child seats, managed to use the bathroom without toilet seat locks and toddled around the house without bumpers over every sharp object. But for the parents of children who did get hurt, these baby proofing ideas could have saved their children from serious injuries. This post contains affiliate links. Oh yes! You’ll be surprised how quickly your little one ends up walking out the front door or into the basement. Door knob covers were one of those items we thought we were supposed to have, so we got them. Little did we realize how much they would help! Little fingers love finding little holes to stick in. I don’t know why… but it’s true. Just take away the interest and cover up those electrical outlets with outlet plug covers. We used the tension baby gates so we didn’t have to drill in any holes. We had them at the top and bottom of the main staircase. Such a smart decision! One time they were left open (not placing blame, but it wasn’t me), and our toddler toppled down the stairs. He had quite the black eye for a while. We didn’t need pinch guards until we had our second child. Our oldest liked to close doors — and of course, toddlers don’t care if someone else’s fingers are nearby, including their little brother’s. 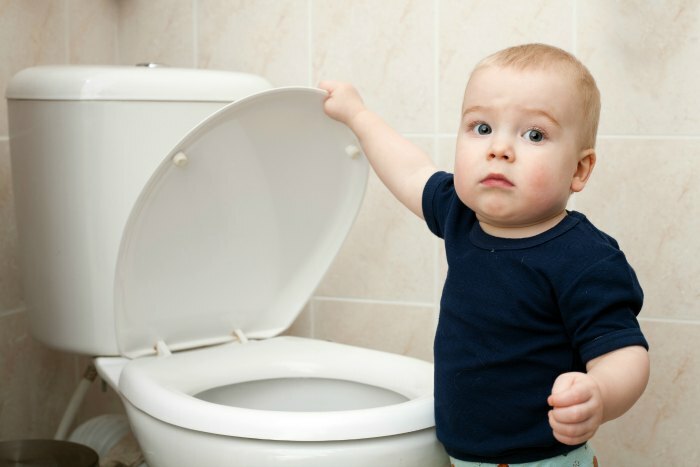 Yes, parents need to be concerned about their child falling into the toilet — but you need to be even more concerned about what your child is putting into the toilet. You’d be surprised at how quickly they can fill that whole sucker with Duplo legos or blocks. And if they pull the handle… game over. 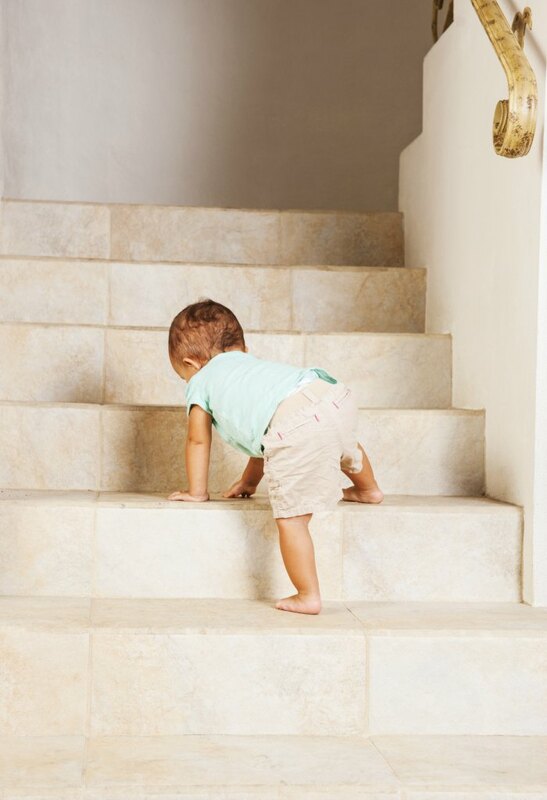 If your child is standing, then they are ready to crawl up any piece of furniture you have in the house. To keep the furniture from toppling over onto them, you’re going to want to anchor your furniture to the wall. Yes, furniture straps can seem a bit over the top. But do you know how many stories I’ve heard about a parent leaving the room for one second and discovering their kiddo on top of the dresser or book case the next? My sister-in-law once found her toddler sitting on top of the refrigerator! Many toddlers are born gymnasts. My husband and I used to joke — if there’s a corner nearby, our son will try to fall into it. 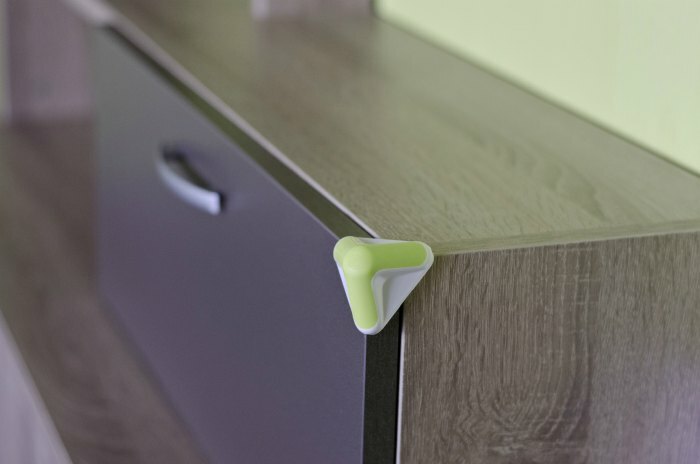 It’s not just for when you’re child is learning how to walk, baby proofing the corners of furniture is also for when they’re running aroudn the house… which they are guaranteed to do. Adding corner protectors could be the difference between a mild bang and stitches. Although manufacturing has gotten smarter over the years, if you have older blinds, you’re going to want to have blind cord wind-ups on hand. You can’t imagine how quickly a child could get caught up in those cords. And while there are other smart steps you can and should take, these were the most used items in our home. Although this infographic offers helpful tips, I would add one more tip to the mix — do not store any cleansers or other kitchen cleaning items under the sink. Instead, place cleaning agents in the cabinet above. Our son, much to our dismay, figured out how to unlock the cabinet doors quickly. It seemed strange at first to put the chemicals somewhere else, but it has kept our cleaning agents handy while keeping them out of the hands of our boys. And we still keep them there to this day! everything else? complete waste of time and money! I thought this was helpful. Thanks for sharing! Do we need to go that crazy? With my kid, most definitely!! With his developmental delays and his non-stop action, it was a must. We had a long gate that stretched around our fire place with the wood stove insert. The blinds that I ordered for our living room and dining area have no cords. I had the stairs gated top and bottom (but we mostly live in our ground floor). No house plants. Every cupboard and drawer in the kitchen was locked (there are some great locks these days). To this day, I have all the sharp knives and other cutting tools in one drawer. Locked the cabinets in the bathroom. Changed out the electric outlet covers to safety ones. Had padding around the top edge of the coffee table. Doors had the things over the knobs so Little Man couldn’t open them (with his weak hand strength, it was years before he could defeat those). And even with a toilet lid lock (yes, we needed to lock it), Little Man still managed to flush a pair of his sunglasses down. They were discovered when we had our septic tank inspected and pumped when L.M. was 7. I had always wondered what had happened to them. LOL! Just remembered that I had one small cabinet that I kept plastic items in, that was not locked- so Little Man could have his safe cabinet to get into. Great infographic! Thanks for posting. Found you via the Family Fun link party! Feel free to link up at our party, too! Hi Jennifer. This is awesome infographic. Very helpful for me and our family, thank you soo much for posting. I noticed that the infographic image is broken. I cant see it on this page, but I can see it on Pinterest.